Isabella of Castile is classically remembered as an indomitable queen and a byword for the Spanish Inquisition. Many readers have only a vague sense of her character from reading novels in which she was mentioned by name or played a small role. C. W. Gortner takes this enigma and breathes life into a complex and misunderstood woman, from her early childhood in royal poverty, through her volatile adolescence at her brother’s insidious court, and finally to her trials and triumphs as Queen of Castile. Isabella’s personality is fixed early on as a responsible and dutiful daughter, caring for her ailing mother and worrying over her younger brother, who is being set at the head of a rival faction against their older, half-brother, Enrique (Henry IV of Castile). 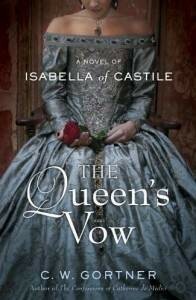 Summoned to court and subjected to the whims of his immoral Queen and strutting favorites, Isabella nevertheless navigates the politics and intrigue intact and with a goal: to bring Castile out of its current state of poverty and depravity, to a thriving and powerful kingdom. Marriage with Aragon’s heir is a smart political move and a desirable match for both Isabella and Fernando. Though their union begins without the sanction of Isabella’s elder brother, whom she deems the legitimate ruler of Castile, ultimately the couple finds that the combined forces of Castile and Aragon indeed brings unification to Spain through the ousting of the Moors and religious reform. Though the Inquisition is generally known as a blot on Isabella’s reputation, this version gives her an impartial role concerning Torquemada and his fanatical views. I found this an easy and interesting read that has engendered a new respect for its protagonist. Though she wasn’t my favorite character from the book—I formed a great liking for her confidante, Beatriz, and an early, grudging admiration for Fernando—she more than met my expectations based on prior characterizations by other authors. The writing style is antiquated enough to set the tone, but satisfyingly modernized to hold readers’ interest–which I’ve noticed, and enjoyed, in his other novels. This is a perfect read for those looking for a story on an obscure royal figure, or a great queen.